Here in Japan, the cherry blossoms (sakura) are now in full bloom. If you have ever thought about making a trip this way, the cherry blossom season is surely the best time to visit. This is arguably the most beautiful time of the year. However, despite their beauty, the cherry blossom season is very short. Only days after reaching full bloom, the flowers begin to fall to the ground. Though this may add to the mystic of the sakura, it is NOT a very good illustration of what we are trying to do at SIBC. As we labor to see the Kingdom of God expand in Japan, we are not satisfied with results that quickly fade away. Rather, we are very much concerned with producing fruit that lasts. To this end, we thank you for your prayers and support of the ministry here. It is through your prayers and the grace of God that lives are touched and transformed by the Good News of Jesus Christ. As you continue to pray for us, here is an update of what has been happening in our lives and in the church. O ur Children’s Easter Party was held on March 31. This has become an annual outreach event where the children of the church are able to invite their friends to celebrate Easter with us. Through games, songs, crafts and the Easter story, we not only want the children (and parents) to enjoy themselves, but also to be introduced to the message of Easter. This year, more than 50 people attended the party, with many of those being first-time visitors to church. Please pray that the Lord would lead many of these people to join us again on Sunday morning. In late January, a special service was held to celebrate the 20th anniversary of Sakai International Bible Church. SIBC founding pastor, Teiichiro Kuroda, was the guest speaker as we gave thanks to the Lord for his faithfulness to the church over the last 20 years. In preparing for this event, we discovered that over a thousand different people have visited the church and 47 people have made the decision to be baptized. On top of that, many people who once attended SIBC are now serving as pastors and missionaries in various parts of the world. By Western standards, SIBC is a small church, but God has truly used this small body of believers to touch and change the lives of many. We are very grateful to the Lord for allowing us to be a part of this ministry for the last 10 years. Please pray that He will continue to use both us and the church to establish His kingdom here in Japan. F or two weeks around Easter, the DiMeglio family (Lou, Joanne and Lindsey) from Christian Layman Church in Oakland, CA came to SIBC to serve in the church. 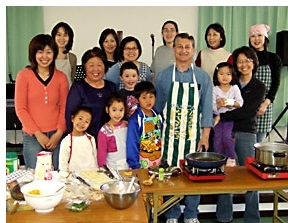 Besides being a huge help at the Easter Party, they also taught Italian cooking classes. Once for the church and once for Chris’ English class, Lou taught the students how to make ravioli. 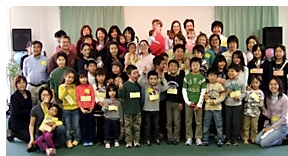 This was a unique experience for the Japanese, and we even had a couple on non-Christians come to church just to attend the classes. We thank the Lord for the DiMeglio’s service to the church and their fellowship with us. 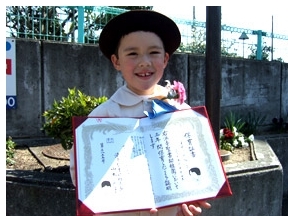 On the family front, Luke graduated from his Japanese kindergarten in mid-March. In typical Japanese style, the occasion was marked with a very big, very elaborate graduation ceremony. Kimonos were dawned, flowers were presented, songs were sung, prayers were prayed and diplomas were awarded to the 50 children in his graduating class who spent the last three years together. Being in a Japanese-language kindergarten was not always easy for Luke, but we are very proud of the growth and maturity that we have seen in him. Now Luke has a bit of a break until he starts first grade at a Christian international school. Please pray for him as he prepares to make this adjustment. B ecause Luke’s new school is located about an hour away from Sakai City, we have decided to move in order to be closer to the school. In late March we found a house for rent in Ikoma City, Nara Prefecture, and we will make the move around May 21st. Please pray for us as we prepare to make the move. Besides all of the red tape that comes with moving to a new resident in Japan, we also have much packing to do. May we be able to do all that needs to be done while still maintaining our responsibilities at the church. This will be a very busy month for us, but we are excited about the new life that awaits us in Ikoma. We will inform you of our new address, phone number, e-mail address, etc… in our next newsletter. Well, that is about it for now. Thanks again for all of your prayers and support. Blessings to you all.